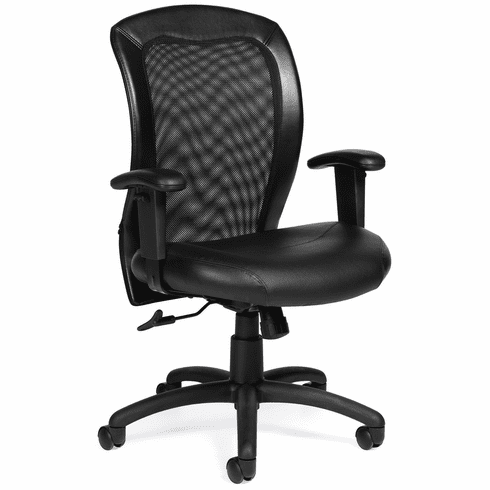 For those that spend long hours at their desks, this mid-back mesh airflow chair will keep you cool and comfortable. The mesh back allows maximum breathability, while the built-in lumbar gives you the support you need. The thick padded cushion is upholstered in durable Luxhide, which gives the look and feel of genuine leather, with the durability and easy maintenance of vinyl. This chair features adjustable seat height, tilt with tension adjustments and lock, and T style arms that are height adjustable. The molded base is scuff resistant, and the dual wheel carpet casters make rolling on all types of carpet easier. This chair meets or exceeds ANSI/BIFMA standards. Dimensions: Seat Size: 21"W x 18" - 19.5"D. Back Size: 18"W x 19.5"H. Seat Height Adjustment: 17" - 21"H. Overall: 38"H x 24.5"W x 25"D. Five year limited warranty from Offices to Go. This chair normally ships within 1-2 business days.